کنده و گل حفاری حاوی مقادیر قابل ملاحظه‌ای هیدروکربن نفتی است که علاوه بر آلودگی محیط زیست، سلامت انسان را به مخاطره می‌اندازند. هدف از این تحقیق بی‌خطرسازی کنده حفاری توسط فرایند زیستی ورمی کمپوست و کمپوست لجن فاضلاب می‌باشد. این مطالعه از نوع تجربی آزمایشگاهی بود و در آن از دو پایلوت به‌مدت دو ماه با دو تکرار با اختلاط یکسان لجن بیولوژیکی با کنده حفاری آلوده به TPH به همراه خاک اره و زائدات باغبانی به‌منظور انجام فرآیند ورمی کمپوست و کمپوست استفاده شد. به‌منظور تعیین میزان غلظت TPH باقیمانده از دستگاه GC-FID استفاده شد.نتایج این تحقیق نشان می‌دهد که پایلوت ورمی کمپوست نسبت به کمپوست راندمان بالاتری در حذف TPH دارد به طوری که بعد از 60 روز میزان TPH در توده مخلوط از مقدار اولیه 004/42 گرم بر کیلوگرم به 316/11 گرم بر کیلوگرم رسید. راندمان حذف TPHبرای پایلوت ورمی کمپوستA وکمپوست B به‌ترتیب 1/73 درصد و 3/55 درصد در پایان دوره تثبیت به‌دست آمد. همچنین میزان TPH در دو پایلوت کمپوست و ورمی کمپوست در روز 45 ام و روز 60 ام دارای اختلاف معنی‌دار بود (05/0 p< ). نتایج حاصل از این تحقیق نشان داد که فرایند ورمی کمپوست نسبت به فرایند کمپوست،توانایی بیشتری در حذف هیدروکربن‌های نفتی موجود در کنده حفاری پایه روغنی دارد. Cutting and drilling mud contains significant amounts of petroleum hydrocarbons that are detrimental to both the environment and public health. The objective of this study was to remove the hazardous components of drill cutting mud using the two biological processes of sewage sludge vermicomposting and biocomposting. In an experimental laboratory research, two pilot composting and vermicomposting processes, each over a period of two months with 2 repetitions, were conducted using the the same biological sludge mixed with drill cuttings contaminated with total petroleum hydrocarbon (TPH) along with sawdust and yard waste. The GC-FID unit was used to determine the residual total petroleum hydrocarbon concentrations. Results showed that the vermicomposting pilot had a higher TPH removal efficiency than did the composting one so that TPH concentration in the mixed waste mass declined after 60 days from its original value of 42.004 g/kg to 11.316 g/kg. In other words, TPH removal in the pilots A (vermicomposting) and B (biocomposting) were 73/06% and 55/3%, respectively. Moreover, the TPH levels in the two composting and vermicomposting pilots on the 45th and 60th days showed significant differences (p < 0.05). The study showed that the vermicomposting process enjoys a higher capability than the composting one in removing TPH from oil-based drill cutting waste. Alef, K., and Nannipieri, P., 1995, Methods in applied soil microbiology and biochemistry, Academic Press, London. Ameh, A.O, Mohammed-Dabo, I.A., Ibrahim S., Ameh, J.B., Azienge, C.D. & Taninu, Y., 2011, “Earthworm survival in used engine oil contaminated soil spiked with manure", International Journal of Biological & Chemical Sciences,5(3), 923-929. Callaham, M.A., Stewart, A.J, Alarcon, C. & McMillen, S.J., 2002, "Effects of earthworm (Eisenia fetida) and wheat (Triticum aestivum) straw additions on selected properties of petroleum contaminated soils", Environmental Toxicology Chemistry, 21(8),1658-1663. Chandran, V., 2010, "Study of vermifiltration of fruit juice industry and petroleum industry wastewater and vermiremediation of soil contaminated by petroleum products using earthworms (Eisenia fetida)", 40 CP Research Project for the Fulfilment of Master Degree in Environmental Engineering, Griffith University, Australia. Dendooven, L., Alvarez-Bernal, D. & Contreras-Ramos, S.M., 2011, "Earthworms, a means to accelerate removal of hydrocarbons (PAHs) from soil? A mini-review", Pedobiologia, 54, 187-192. EPA., 1996, Total Petroleum Hydrocarbons (TPH) as gasoline and diesel SW-846 Method 8015B, Revision 2, USA. Fazelipour, M., Takdastan, A. & Jou, M.S.S., 2011, "Survey on chlorine application in sequencing batch reactor waste sludge in order to sludge minimization)", Asian Journal of Chemistry, 23(7), 2994-2998. Hajsardar, M., Takdastan, A., Ahmadi, M. & Hasani, A.H., 2011, "Study of reducing waste biosolids in sequencing batch reactor by ozonation to waste biosolids", Asian Journal of Chemistry, 23(8), 3615-3619. Hickman, Z.A. Reid, B.J., 2008, "Earthworm assisted bioremediation of organic contaminants", Environment International, 34, 1072-1081. Hosseini Panah, E. & Takdastan, A., 2015, "Feasibility of total petroleum hydrocarbon removal from drill cutting with digested sludge using earth worm", Journal of Mazandaran University Medical Science, 25(133), 319-324 (In Persian). Illmer , P., Barbato, A. & Schinner, F., 1995, Methods in soil biology, Springer-verlag, Berlin. Kardani, M. & Takdastan, A., 2015, "Removal of total petroleum hydrocarbons using vetiveria zizanioides and microbial population changes in soil contaminated with oil in Ahvaz", Journal of Mazandaran University of Medical Science, 25(131), 87-97 (In Persian). Mahmoudi, P., Takdastan, A., Alavi, N., Mosavi, A.A.J. & Kaydi, N., 2013, "Study of excess sludge reduction in conventional activated sludge process by heating returned sludge", Asian Journal of Chemistry, 25(5), 2627-2630. Maike, S. & Filser, J., 2007, "The influence of earthworms and organic additives on the biodegradation of oil contaminated soil", Applied Soil Ecology, 36, 53-62. Opuada, A., Ali, I., Ibrahim, S., Ameh J.B., Azienge, C.D. & Tanimu, Y., 2012, "Effect of earthworm inoculation on the bioremediation of used engine oil contaminated soil", International Journal of Biolchemical & Chemical Sceinces, 6(1), 493-503. Pazoki, M., Takdastan, A. & Jaafarzadeh, N., 2010, "Investigation of minimization of excess sludge production in sequencing batch reactor by heating some sludge", Asian Journal of Chemistry, 22(3), 1751-1759. Rajiv, K., Chndran, V., Soni, B., Patel, U., & Ghosh, A., 2012, "Earthworms: Nature’s chemical managers and detoxifying agents in the environment: An innovative study on treatment of toxic wastewaters from the petroleum industry by vermifiltration technology", Environmentalist, 32, 445-452. Rajiv, K., Herat, S., Bharambe, G. & Brahambhatt, A., 2009, "Vermistabilization of sewage sludge (biosolids) by earthworms: Converting a potential biohazard destined for landfill disposal into a pathogen-free, nutritive and safe biofertilizer for farms", Nathan Campus, Brisbane, QLD 4111. Rouyanian Firouz, Z., Takdastan, A., Jaafarzadeh Haghighifard, N.A., & Sayyad G.A., 2011, "Feasibility of land treatment that removal of nitrogen and phosphor of chonaibeh wastewater treatment plant (Ahwaz)", Asian Journal of Research in Chemistry, 4 (4), 597-601. Safwat, H., Shakir, H. & Weaver, R.W., 2002, "Earthworm survival in oil contaminated soil", Plant and Soil, 240, 127-132. Salanitro, J.P., Dorn, P.B. & Huesemann, M.H., 1997, "Crude oil hydrocarbon bioremediation and soil ecotoxicity assessment. Environmental Sciences" Technology, 31, 1769-1776. Schaefer, M. & Juliane, F., 2007, "The influence of earthworms and organic additives on the biodegradation of oil contaminated soil", Soil Ecology, 53-62. Schaefer, M., Peterson, S.O. & Filser, J., 2005, "Effects of Lumbricus chlorotica and Eisenia fetida on microbial community dynamics in oil-contaminated soil", Soil Biology and Biochemistry, 37, 2065-2076. Shin, K. & Kim, K., 2001, "Ecotoxicity monitoring of hydrocarbon-contaminated soil using earthworm (Eisenia foetida)", Environmental Monitoring and Assessment, 70, 93-103. Sinha, R.K. & Soni, B.K., 2012, "Experimental studies on treatment of petroleum-contaminated wastewater from automobile industry in Brisbane", Griffith University, Brisbane. Takdastan, A., Mehrdadi, N., and Torabian A., Azimi, A.A. & Nabi Bidhendi, Gh., 2009, "Investigation of excess biological sludge reduction in sequencing bach reactor", Asian Journal of Chemistry, 21(3), 2419-2427. Takdastan, A. & Eslami, A., 2013, "Application of energy spilling mechanism by para-nitrophenol in biological excess sludge reduction in batch-activated sludge reactor", International Journal of Energy and Environmental Engineering, 4(1), 1-7. (In Persian). Takdastan, A. & Pazoki, M., 2011, "Study of biological excess sludge reduction in sequencing batch reactor by heating the reactor", Asian Journal of Chemistry, 23(1), 29-33. Takdastan, A., Azimi, A.A. & Jaafarzadeh, N., 2010, "Biological excess sludge reduction in municipal wastewater treatment by chlorine", Asian Journal of Chemistry, 22(3), 1665-1674. Takdastan, A., Mehrdadi, N., Azimi, A. A., Torabian, A. & Nabi Bidhendi, G., 2009, "Investigation of intermittent chlorination system in biological excess sludge reduction by sequencing batch reactors", Iranian Journal of Environmental Health Science and Engineering, 6(1), 53-60. (In Persian). 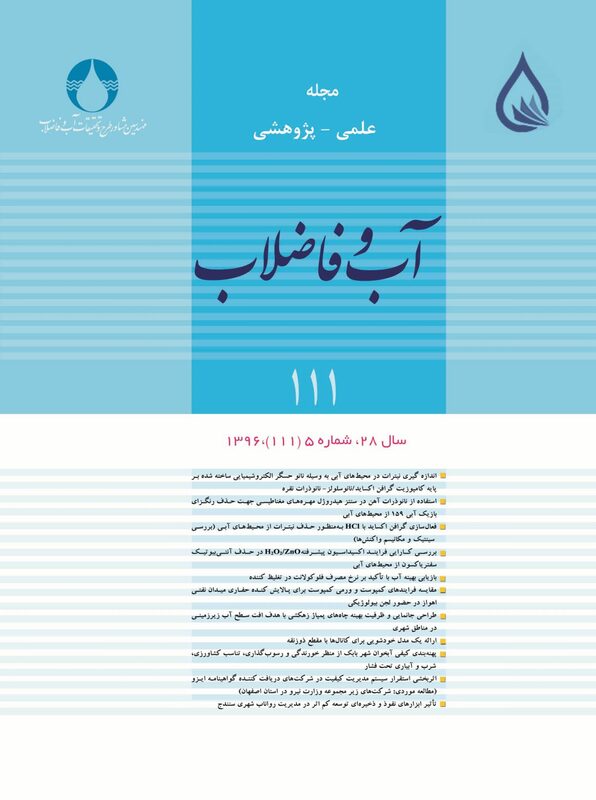 Takdastan, A., Mehrdadi, N., Torabian, A., Azimi, A.A. & Nabi Bidhendi, Gh, 2009, "Investigation of excess biological sludge reduction in sequencing bach reactor", Asian Journal of Chemistry, 21(3), 2419-2427. USEPA., 2001, Water Office of Science and Technology Engineering and Analysis Division (4303) 1200 Pennsylvania Ave. NW Washington, DC 20460 .Method 1684 Total, Fixed, and Volatile Solids in Water, Solids, and Biosolids, EPA-821-R-01-015. Zazouli, M.A., Asgharnia, H., Yazdani Cherati, J., Ziaee Hezarjeribi, H., & Ahmadnezhad, A., 2015, "Evaluation of cow manure effect as bulking agent on concentration of heavy metals in municipal sewage sludge vermicomposting", Journal of Mazandaran University of Medical Science, 25(124), 152-169. (In Persian).